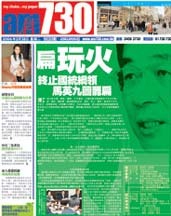 For the general background on the issue, see Taipei Times and Xinhua. For western media headlines and Taiwan public opinion poll results, see Comment 200602#078. News that the Taiwanese president has scrapped the National Unification Council and its politically symbolic guidelines has generated strong calls from mainland internet users for Beijing to take a tougher stand on Chen Shui-bian and Taiwan. They interpreted the move as a serious step towards independence and insisted the critical moment had come for Beijing to take action to resolve the Taiwan issue. Many chat-room comments supported implementing the Anti-Secession Law through military force. On popular news portal sina.com.cn, more than 6,000 people took part in discussions within two hours of the news breaking. "Ah-Bian [Chen Shui-bian's nickname] pushed so far because he has seen that - time and time again - we just issued warnings. Our government should not wait this time," one person wrote. Another writer said: "It should be made clear to Chen Shui-bian and the Taiwanese people that the move is seen as crossing the line. [The mainland] will punish Taiwan according to law once Taiwan unilaterally changes the current cross-strait status quo." A more provocative posting was copied by others in a sign of support. It read: "Let's fight the war. Forget the Olympics. Let the whole nation be mobilised and get Taiwan back. Ah-Bian is testing our limits." Some postings even referred to Mr Chen as "a pro-independence terrorist" and called for extreme action against him, including assassination. Occasional calls for level heads and peace were buried among voices clamouring to settle the Taiwan issue through military action. "Ah-Bian is trying to provoke our leaders. We, especially university students, should keep a clear mind and work for unification, and not be misled by Ah-Bian," one contributor wrote in response to a Xinhua report. What about Hong Kong? I have not seen a public opinion poll yet. For the Hong Kong media, Xinhua presented its reading ("HK newspapers criticize Chen's secession activities"). It should be duly noted that four newspapers (Takungpao, Wen Wei Po, Hong Kong Commercial Press, Hong Kong Economic Times) are pro-Beijing in their political stances, and therefore the review is not representative of all Hong Kong newspapers. Meanwhile, Oriental Daily featured a murder case, The Sun featured the welfare cheat trial, Ming Pao and Sing Tao featured an announcement about Hong Kong education. In Apple Daily, the front page is about a Pacific Coffee female employee dropping dead three hours after taking some Chinese medicine. The event is covered in the inside pages, of course. The following is a translation of the op/ed piece by Lu Feng in Apple Daily. This is likely to be the op/ed piece that is most sympathetic to president Chen Shui-bian. Even though Taiwan president Mr. Chen Shui-bian suffered a series of setbacks in recent elections and even though many people (including the Chinese government and even certain members of the American government) regard Chen Shui-bian as the "lame duck president," the controversy over the abolition of the National Unification Council and the guidelines for national unification showed that Mr. Chen's political capabilities (especially the political capability to "create trouble") should not be under-estimated or ignored. The National Unification Council and the guidelines for national unification were established and formulated during the era of former president Lee Teng-hui. But ever since its creation, the National Unification Council has been basically an empty office. It performed no actual work, and therefore one cannot speak of any results towards unification of the two sides. When Chen Shui-bian and the Democratic Progressive Party assumed power, nobody mentioned the National Unification Guidelines again. The National Unification Council became a "paper organization" with an annual budget of just over 200 Hong Kong dollars. But Mr. Chen Shui-bian had the ability to turn this "paper organization" into a political bombshell and an important topic. This caused the American government to spin around in circles and the Chinese government to fume in rage. With this sort of political capability and this sort of ability to manufacture trouble, the man does not look like a lame duck! Of course, the American government and the Chinese government are responding strongly to Chen Shui-bian's abolition of the National Unification Council and guidelines for national unification not because they gave any importance to this "paper organization." Instead, they are concerned that Chen Shui-bian is making another big forward step towards Taiwan independence. They are worried that Mr. Chen Shui-bian wants to unilaterally change the political position of Taiwan so that the situation heads towards an irreversible state. But if you understand the political situation across the strait, if you understand the international situation and if you understand the Taiwan political environment, you will know that neither Chen Shui-bian nor the Democratic Progressive Party government have the ability to alter the status quo of neither-unification-nor-independence. Everybody knows that for Taiwan to maintain the status quo and continue to govern separately from mainland China, the support and protection of the United States is of utmost importance. This includes military and diplomatic support, such as the supply of vital defensive weaponry and so on. If the Taiwan government angers the United States by unilaterally changing the present situation, the American support and protection will disappear. Then Taiwan will be isolated and helpless, and unable to defend itself. Even the most ardent pro-independence and enthusiastic politician would not be stupid enough to violate America's taboo and attempt to change the position of Taiwan in a material sense. Besides, it is still the mainstream in popular opinion in Taiwan and the political forces in Taiwan to maintain the status quo. It is still the mainstream to have neither unification nor independence and avoid any deterioration in relationships. Even if President Chen Shui-bian and the Democratic Progressive Party hope to try harder to advance Taiwan independence, they will not have the support of the Legislature, they will not have the support of the other political parties and they will not be able to pass through all the political and constitutional hurdles. In the end, Taiwan will still remain in the balanced state of neither unification nor independence. In other words, Mr. Chen Shui-bian and the Democratic Progressive Party government are only able to create a bit of noise and inconvenience without causing any material impact to the state of relationships between the sides of the strait. The Beijing government ought not react strongly to these little movements by Mr. Chen and the Democratic Progressive Party, and they should not abandon the efforts to promote exchange and improve relationships between the two sides. Actually, the more ideal and progressive way is for the Beijing government to begin communication with the Democratic Progressive Party and even Chen Shui-bian without any pre-conditions and to begin a dialogue. It can be seen that Mr. Chen and the Democratic Progressive Party are making all these small movements because they have strong Taiwan independence leanings, but more because they have been excluded and marginalized in the communication and dialogue between the two sides of the strait. So Mr. Chen and the Democratic Progressive Party had to make various kinds of noise and different kinds of small movements in order to show that they are a force that must not be ignored. If the Beijing government continues to treat Mr. Chen and the Democratic Progressive Party as "absent" (冇 到 ) and shut them out of the communication, the latter can only create even more noise and trouble. Even if these noises and troubles may not trigger off conflicts, it will make it hard for cross-strait relations to de-froze and turn for the better fully.